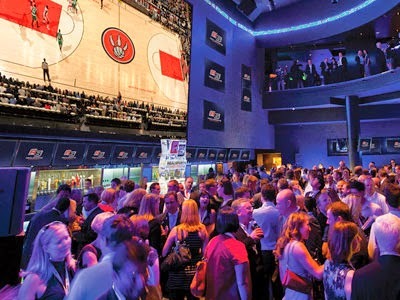 In the heart of Toronto's sports and entertainment district and located right beside the Air Canada Centre, Real Sports Bar & Grill is impressive. Real impressive. Here's the kicker though: I don't even play sports. None at all. But I watch sports! That must count for something, right? But even then it's rare... I mean, I watch the Olympics and the World Cup but really, who doesn't? There's no way getting around it, I'm just not that into sports. But trust me once you step foot into Real Sports (Twitter: @RealSports, Facebook: Real Sports) all that goes out the window. The place has that "Wow" factor, you know I mean? With its 25,000 square foot space, 199 screens and 39-foot high-definition projector (the biggest one in any sports bar in the world) it's no wonder that ESPN voted Real Sports as the #1 sports bar in all of North America. Having said all that, I found myself at Real Sports last week; not for a World Cup game but for a menu tasting (of course it's food-related.) I was one of the lucky ones chosen to taste some of their new menu items - a sneak peek of what will soon be available at Real Sports come Friday, August 1st (#RSBGSneakPeek). Recently joining the Real Sports' kitchen is chef Matthew Sullivan (formerly of Skin + Bones). He took the time in between courses to explain to us his new menu. I really enjoyed the spicy broth here. I've had my share of steamed mussels with bland and flavourless broth so this was very welcoming. This massive Chicago dog is prepared just right (i.e. no ketchup). I personally didn't like these wings because I'm not a fan of chicken parmesan but if you are, these will be perfect for you (I prefer my wings spicy, crispy and drenched in sauce). This was one of my favourite dishes that evening. The crisp salad was so fresh and I enjoyed the crunch from the quinoa. I did not expect something so creative and unique from Real Sports but then again, I shouldn't be surprised now that chef Sullivan is in the kitchen. To start, this dish is really fragrant; the rich aroma of the Thai curry is immediately evident once you open the wrapping. The fish is nice and moist, and on a bed of aromatic rice and veggies, this dish is a winner. Another standout dish. I love the vivid colours and presentation here. At first I was afraid that the steak would be tough and dry but it turned out juicy and tender (I found out afterwards that the meat was sous vide). Slightly charred with a spot-on marinade, I could easily have the steak on its own. However, the fun part about this dish is that you get to assemble your own steak tacos! The corn, slaw and tomatoes were all excellent complements to the steak either on its own or mixed together (my favourite is the corn). Wrapped in warm tortillas, these tacos are great as a shared appetizer or as an entree. One rule when eating this dessert: make sure you dig right in with your spoon. Yes, all the way to the bottom and up again. It is only then you'll get the graham cracker, chocolate and marshmallow all in one bite. I would've liked this dessert better if it was served warm instead of cool or at room temperature since the warmth will give that cozy, outdoors-y feeling (just like eating s'mores by the campfire). Sweet. Decadent. Rich. Brownie. Cheesecake. This is an ideal dessert for those who like all of the above five things. 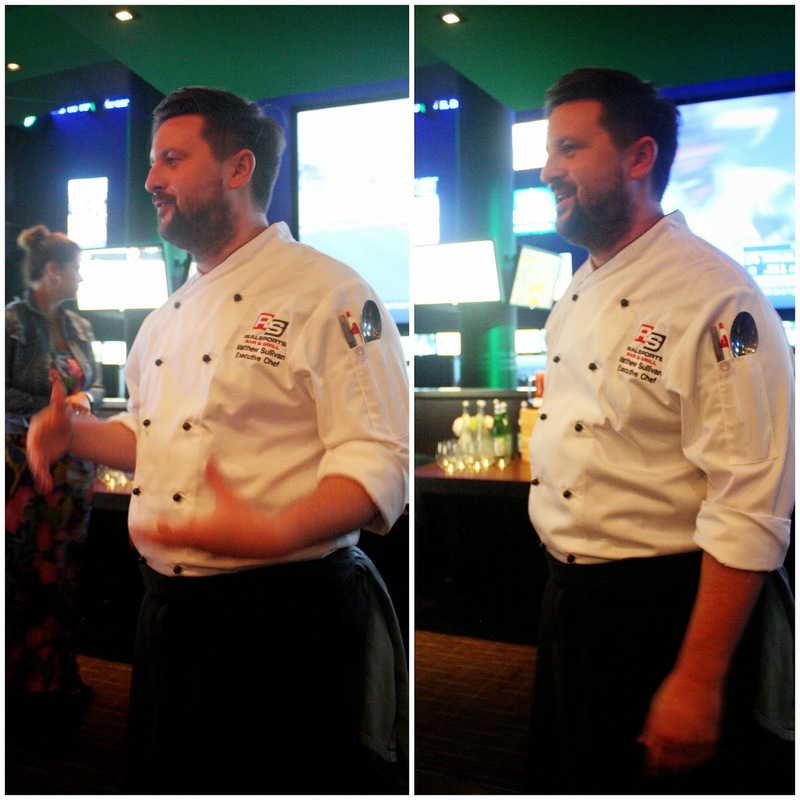 Despite the fact that "casual" food has never been chef Sullivan's style (you'll see what I mean if you click on the links under "Related Posts") his refined skills and experience in the kitchen is what makes him an asset when it comes to elevating the menu at Real Sports. Sure - wings, burgers, fries, sliders - these will always be staples at a sports bar and that's perfectly fine. However, Sullivan (@gastromatthew) is upping the ante on dishes such as the fresh, crisp Quinoa Salad that I couldn't get enough of, the uniquely presented Thai Curry Tilapia, and the creative DIY Chipotle Flat Iron tacos. It is precisely these plates that'll distinguish Real Sports Bar & Grill from the rest of the crowd.